These are all the sites which can be visited throughout the game. At first only a few will be available, but more will become available throughout the game. For some sites, certain actions, which could be missed during gameplay, need to be executed for the sites to become available. Gabriel is taken from Couiza to Rennes-Le-Chateaux by taxi, where he received a room in the hotel. Rennes-Le-Chateau also holds the church, the Tour Magdala, a museum and the Villa Bethania. Timeblocks often start and/or end in Rennes-Le-Chateau. Couiza contains the trainstation where Gabriel arrived. He will return there to question the ticketsales woman and the taxi driver who took him to Rennes-Le-Chateau. Lady Howard and Estelle are desparately digging around in this area. The site becomes available by following them with the Harley. Aside from a few conversations, this site holds nothing of interest. 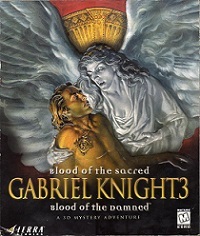 After Abbe Arnaud refers Gabriel to the templar scholar, Larry Chester, Gabe will pay him a first visit. He will return several more times as it turns out Larry has a hidden identity and agenda. The house is also accessible via the Chateau the Blanchefort, where Gabriel sometimes needs to park to avoid detection. This site will be visited by the tour group, but both Gabriel and Grace will come here several times to use their binoculars and see what others are doing across the valley. Another site is found by taking a left on the parking lot (where Wilkes can be found once), and "The Site" (number 12 on the map)is on the other side of the road, across the bridge. Both Madeline and Mosely have their focus on this place to find the treasure, which annoys Madeline pretty much. It lateron turns out that Mosely works for the CIA and Madeline for the French Secret Service. The CIA hacked into their computer system and extracted information on their investigation, which explains why both were digging at the same place. Wilkes' body will also be found in a remote area of this site. Another site with nothing going on. Gabriel will see Madeline stop there with her van, but not even the conversation, he can have with her, yields any points. L'Ermitage is located in the very center of the circle of Le Serpent Rouge, and is depicted in one of the paintings which is link to the mystery. John Wilkes will be found here at one point and also grace will dig here and find a note in the cave. Unlocks after the tour group goes there and find the bodies of Mallory McDougal. Gabriel goes investigating the crime scene. Nothing much of interest here. Gabriel can go there to find Buchelli and Wilkes having a drink in the bar one evening, and take Buchelli's license plate number for an extra point in the process. Becomes available when Grace spots Buchelli's moped with her binoculars from Chateau de Blanchefort. He buried the bloodline manuscript there, which Grace needs to dig up again and take its fingerprints. Cross the road at the Chateau de Blanchefort parking lot, and cross the bridge. Grace will find a note here and attempt to dig, but find nothing as it is all solid rock. Vineyard and castle of Montraux. First the tourgroup will go there. Lateron Gabriel will go there under the disguise of a journalist and find tire tracks of Mallory of McDougal's car. The first stop of the tour group. Emilio Baza will scrabble the word "SUM" in the sand, which Grace takes note off and will need to solve one of the Serpent Rouge puzzles. Solving the Serpent Rouge puzzle will reveal this place to Grace. However the site is fenced off. As it is behind Mount Cardou, it is believed that Doctor Wen find Egyptian artifacts there, but Grace (and Lady Stiles and Estelle) can't reach the place. It is fair to assume that Montreaux bought the land and put the fence to keep visitors out. Grace will also find a note here. 16) Southwest arm of the Hexagram. The other side of the hexagram. Grace will find Wilkes' handkerchief here, indicating he was about to find the entrance, which led to his demise. Grace finds another note here aswell. Gabriel, Mosely and Mesmi will enter the underground tempel from here in the final timeblock of the game.